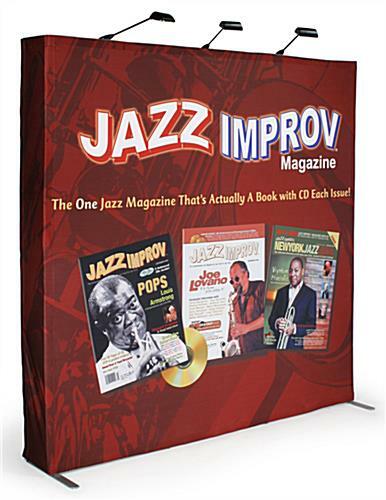 These "pop up displays" offer a great way to grab attention at any promotional event. 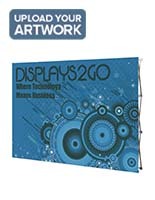 Our "pop up displays", also called trade show booths, feature lightweight aluminum frames, portable carrying cases, and end caps for a wrap around finish. 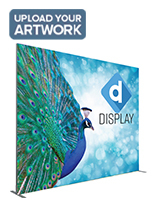 The end caps are an extension of the display material that covers both sides of the aluminum frame. 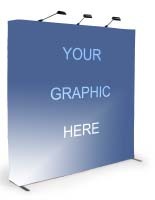 These custom graphics attach easily to the frame with hook and loop adhesives. 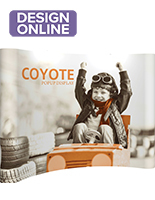 The custom graphics are printed with a 720 dpi resolution on premium knitted polyester. When completely assembled, the fabric is stretched tight to minimize wrinkles giving you the best look possible. 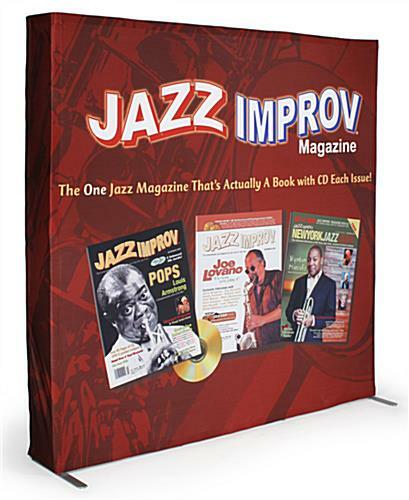 These trade show booths, pop up displays are 7.5' wide and come with flood lights to enhance the visual appeal of your exhibit. 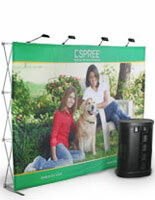 These trade show exhibits, pop up displays include a portable heavy-duty wheeled carrying case for easy transportation. With roller wheels, dual handles, lock-and-key security, these travel cases offer portability and convenience at no extra cost! 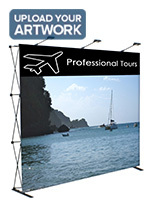 Your trade show display will not fit in the travel case with the graphics attached. 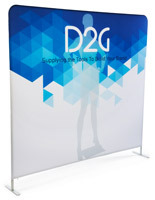 While all graphics must be removed before compacting the unit, there is room in the case for you to store your banner. 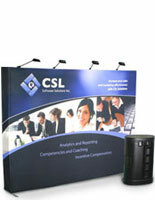 These pop up displays are perfect display booths for trade shows, exhibitions, or conventions. 89.0" x 88.3" x 17.5"
18.0" x 41.0" x 18.0"
Worked awesome for first few events but it is not very sturdy. If anything touches it it will topple over. The supporting poles on one side snapped after about 15 uses. There is no warranty on this item either. We're sorry to hear about the trouble with your backdrop, Anya. One of our customer care specialists would be happy to reach out to assist you. Thank you for your patience! This fabric is larger than the frame. So when i install the fabric print over the frame it hangs over the edges and doesnt allow for a tight installation. Not too happy with it but it will have to do. Hi Tony, We're sorry to hear you are unhappy with the fabric. This is certainly something we'd like to assist you with; one of our customer care specialists will reach out to you soon. Thank you for your patience! We had a great ordering experience, correspondence with the graphics team was painless, and the shipping was super speedy. The product itself came out flawless! We couldn't be happier! The booth itself is fine. But the case is not. It just came back from its first show and the case cracked in two places. I contacted customer supposed and was told that this is a carrying case, not a shipping case. We are very sorry that your order broke and you had some issues replacing it, Tina. Someone will reach out to you promptly to address this.